METALSHIPS from Vigo, Spain, contracted a 135 m x 27 m, DP2, rigid pipe-laying vessel for J R MCDERMOTT of Houston. Vigo, 17 of September 2012. METALSHIPS has contracted with JR MCDERMOTT a new pipe-laying vessel which will make the number three of MCDERMOTT’s operated vessels of this sort built at METALSHIPS. This unit will be more or less a sister ship of the L/V NORTH OCEAN 105 delivered by METALSHIPS to MCDERMOTT past April. 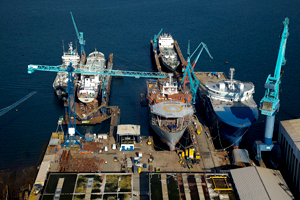 Series”) that the shipyard proved more and more efficient over the years. To date more units on this frame are under negotiation with shipowners worldwide. This new pipe-laying vessel is slated for delivery in Q3 2014. METALSHIPS has also currently under construction a ROV/OCV for TECHNIP which is to be delivered by Q1 2013. The new vessel, to be named L/V NORTH OCEAN 108, will be of 135 m long, 27 m beam and 9.7 m deep, and will be of diesel-electric propulsion, with a total output of 16 MW of installed power. Like the other units, she will be fitted with two stern azipull thrusters, each of 3500 kW, one fore swing-up azimuth thruster of 1500 kW and two fore tunnel thrusters, each of 1500 kW, thus attaining maximum manoeuvrability and highest dynamic positioning ERN. L/V NORTH OCEAN 108 will be entirely built in Vigo and its neighbourhood.